Every little one loves their Daddy. Give your Daddy an attractive Personalized Picture Frame for him to display at work or at home. He will love looking at it, each & every day. Our Personalized Gift measures 11 3/4" x 7 3/4" and holds two 4" x 6" photos. Includes FREE Personalization! 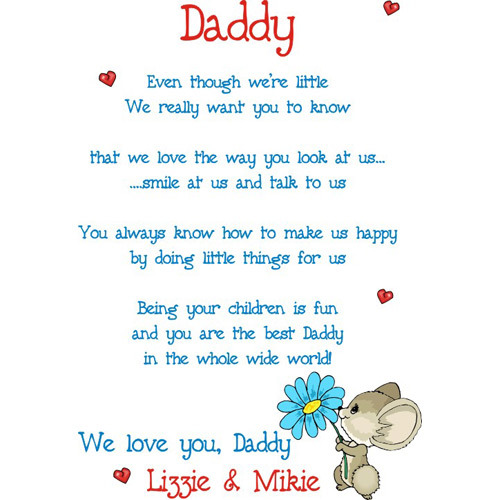 Personalize your I Love You, Daddy Picture Frame with any title and up to 4 names. We will adjust copy to fit multiple children. Example: "Daddy, Papa, Grandpa, etc." This will be a Valentine's gift for my husband. I love how you can personalize it! I know he is going to love it! I had to re-order my frame because it didnt come personalized. Customer service was very friendly and fixed my problem immediately and for free. It was completely hassle-free for me and I have never been so satisfied with someones customer service in my life. They were awesome! Check out our entire collection of Personalized Father's Day Keepsakes - they're great for gifts for Dad. 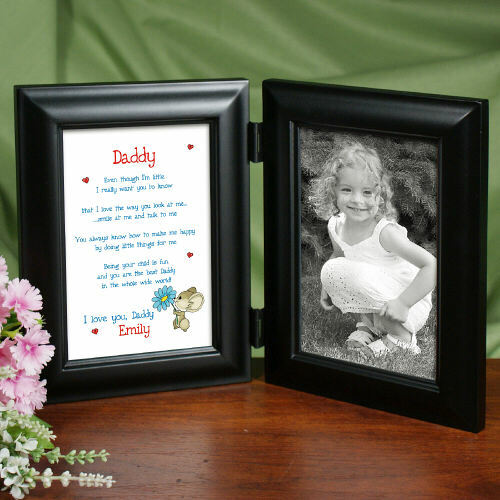 Create an Engraved Keepsake Photo Frame for Dad, Grandpa, Brother or Uncle today.